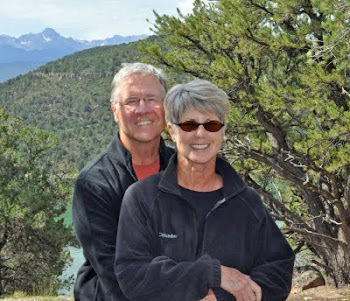 Find us on Google+ Rick and JoAnne's RV Travels: Day Tripping for Sure! Today we headed out early to take in some of the surrounding sites, and experience a new adventure. Heading out of Patagonia State Park, we spotted some deer as they scurried across the road in front of us, and then quickly ran to the other side. It was the first time we had seen deer in the park. Nice! First stop was Bisbee, an old, quirky, picturesque, western mining town in Arizona. Walking through some of the town, taking photos, and relishing in some interesting people watching, we decided to have lunch. We stopped at the allegedly haunted Copper Queen Hotel. My goodness…what a stroke of luck. Both of us enjoyed the most delicious sandwiches we have ever had! Now not really ones to get excited about a sandwich…you have to imagine they were more than delicious for us to even write about them. No photos, we ate them…every bite! No mine tours for us! Coming from Colorado, we have seen our fair share of mines – and truth be told, I (JoAnne) get a bit (ok, more than a bit) claustrophobic! But we did like seeing some of the 1000 Stair Climb steps. If you are interested, there is still time to register for the 23rd world class event that is billed as a 5K but feels like a 10K. Now on to Tombstone, AZ made famous by the movie Gunfight at the OK Corral, a reportedly 30 second gunfight which took place in 1881 between Virgil, Wyatt, and Morgan Earp aided by Doc Holliday and Cowboys, Billy Clanton, and brothers Tom and Frank McLaury. In our eyes, Tombstone is very touristy, as is the Boot Hill Graveyard just outside of town. One can envision how the “powers that be” could really take the town back with more of a feel of the old west…but then again…maybe that’s just us. Well…there was one thing we were sure of, was not seeing the Tombstone Courthouse State Historic Park. Now we truly enjoyed that! As self-described, it showcases glitter and guns along with artifacts and loads of history! While heading back to our camp site, we made a slight detour to the 1870s mining town which is now known as Harshaw Ghost Town just outside of the artsy little town of Patagonia. We were only able to find two reaming structures as well as the cemetery. So we indeed enjoyed a full day of day tripping which leads us to wonder what’s awaiting us! How nice to see a whole herd of deer! We missed going to Bisbee. The day we were going to go we went to the Titan Missile Museum instead. Turns out it was a good idea...the road to Bisbee was closed because of snow. We'll have to visit next time through. We've heard Tombstone was too touristy. Sounds like you thought that as well. Cool remains of the ghost town. Yes, Bisbee is worth the trip. Funky little town and not as commercial as Tombstone. Yet, the courthouse was interesting. It sure does look different without the snow. Thanks for the pictures of the nooks and cranny we have not seen or missed. Yes, Bisbee was fun. The haberdashery shop was one very cool place - all custom made hats! !